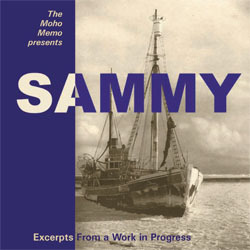 Recording for the Moho Memo's legendary yet incomplete mock opera Sammy was started in an Argentine basement under the watchful eye of a passionate but strict celebrity debutante. Detailing the complexities, trials and travails of modern life, this rare treasure features the singing of songs with words, unusual but effective terrain for the group. The story follows Sammy, a disgruntled stevedore and giant squid, in his search for self and a life of meaning on the high seas. The people and places he sees on his epic Journey must be heard to be believed.